Northbright CHM Tool is a free CHM decompiler that can decompile CHM file, so that you can separately store its HTML pages and images. Apart from that, this CHM decompiler also lets you store currently open page of CHM file in HTML, MHT, or TXT format. This free CHM decompiler is extremely easy to use, and completely free. Northbright CHM Tool makes it very easy to decompile an entire CHM file. Just open this free CHM decompiler. Then under “Select a CHM File” text box, browse to the CHM file on your computer that you want to decompile. After that, select the output folder where you want to store the decompiled CHM file. Then just press on “Decompile” button, and this free CHM decompiler will decompile your CHM file and store in that folder. If you want to just save the currently open page of CHM file as HTML, MHT, or TXT format, Northbright CHM Tool lets you do that too. Just open your CHM file, and navigate to the page that you want to save. After that, open this free CHM decompiler. It will show Title and URL of that page. Just click on the “Save” button, and that page of CHM file will be separately saved in your hard drive. If you want to create help files, check out HTML help file creator, Wink, and Precision Helper. 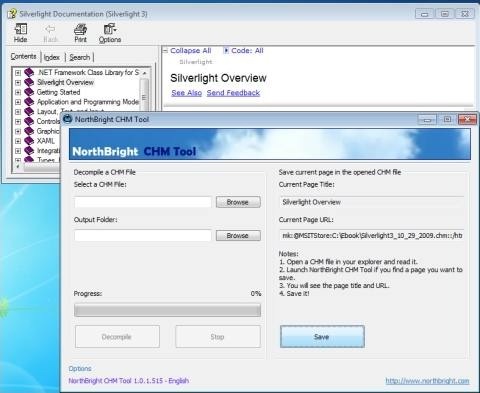 Northbright CHM Tool is quite easy to use. It supports large CHM files too, and the decompile process is quite fast. 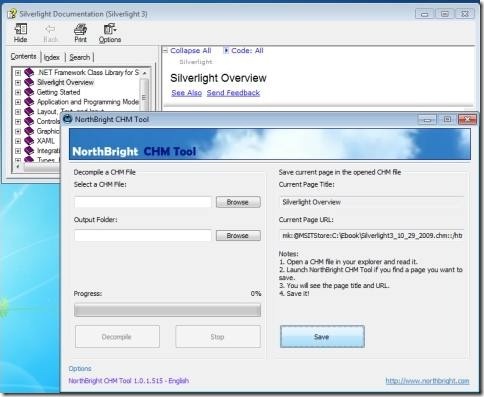 Download Northbright CHM Tool free.